One encounters a number of logistical issues when conducting a documentation session. Below is a list of issues that often must be addressed, some followed by techniques/recommendations that may support documentation efforts. A facility for video documentation must satisfy a number of very specific needs, including a danceable stage, lighting and sound capabilities, and distance for expansive camera angles. Most concert dance is documented during live performance in a proscenium theater setting. 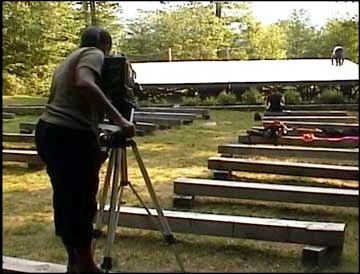 Documenting live performance brings with it a number of issues that will be addressed individually, but in general, the comprehensive documentation of a choreographic work requires a dedicated facility, or at the least additional time in a theater outside the production schedule for a live performance. In an ideal world a facility would be designed to specifically support the needs of video documentation, including a central stage with enough distance on all sides, and above, to record the entire performance space. (Please let me know if you are interested in creating an endowment for the nation’s first facility designed specifically for concert dance documentation!) Since this is rarely the case, effective documentation is often dependent on one’s ability to work within existing facilities. Securing funding for additional time in a large facility is not always easy. Artists may want to consider adding a documentation component to funding solicitations when seeking support for creative work. With proper planning, basic documentation of a work may be accomplished in conjunction with a tech or dress rehearsal. Universities are often interested in adding works to their dance archive for teaching and research purposes. Guest Artist residencies can be ideal situations for making use of funded facilities. Effective video documentation requires access to, not only camera, audio, and lighting equipment, but also a number of other accessories such as monitors, tripods, and cables. With these requirements comes the issue of cost. Many choreographers are unable to afford the high cost of professional equipment, and therefore depend on rentals or contracting production companies that are not specifically trained in dance documentation. If equipment is purchased, one comes face-to-face with the issue of how long it will be until that investment becomes obsolete, not to mention maintenance and repair. Evaluate your own needs and determine if owning your own equipment seems appropriate. These days, many choreographers are also venturing into the creative applications of video, so owning a camera could be of benefit to more than documentation efforts. Partnering with others can also help with equipment costs. Also, the most effective applications for documentation often require operating the camera on full manual mode, so having an expensive camera with lots of bells and whistles is not necessary. The value of an external monitor and professional tripod are often underestimated. Spatial accuracy in the frame is best accomplished by using an external monitor, and the world’s most expensive camera can produce worthless footage when placed on a shaky tripod. A qualified crew of videographers is essential for capturing the best possible footage for dance documentation. Beyond the technical skills related to camera operation that are expected of any videographer, a dance documentation specialist must appreciate the communicative effects of time, space, and energy generated by camera movement and composition in the frame, specifically in relation to the choreographic intentions of the dance that is the subject of documentation. These specialties are addressed in more detail in the Aesthetic Issues area of this site. Crew must first develop a basic technical understanding of camera operation, including The Big Three—Focus, Exposure, White Balance. Coordination and sensitivity to camera movement must be developed in order to manually control camera features while partnering the camera into motion. A Documentation Director must facilitate communication between crew, ensuring clarity of roles and responsibilities. Directing a crew may involve predetermining camera assignments, posting call times, reviewing goals of the shoot, collecting and proofing master tapes, and calling and/or planning shots. Specific techniques may be addressed in the form of dance documentation workshops or courses. Individuals interested specifically in techniques for dance documentation may find it useful to look into tangential fields, such as film, digital media, communication arts, etc. Whether conducting documentation during live performance or as a dedicated session, there are a number of productions elements that must be considered. Of these, lighting and sound are the most relevant. The production crew must work collaboratively with the video crew to ensure the optimal documentation product. Capturing high quality audio, including sounds from the stage, and accurately recording colors on the stage depend on preparatory details. A solid-colored, clean background for documentation may also require work with the theater’s production crew. The needs of the documentation crew must be taken into consideration when planning a production timeline, particularly when working within the constraints of those last precious moments before the house opens for live performance. Time must be set aside for conducting a sound check and setting a focus and white balance (see Technical Issues) on each camera prior to closing the curtain and/or dimming lights before a performance. Whether the audio source comes directly from the sound board or through the microphone on the camera, a sound check is recommended for setting the incoming audio level. This may require the assistance of the Sound Board Operator. Addressing these issues during those high stress moments prior to a performance may be best accomplished if all involved acknowledge the importance of documentation in advance. Remember, the life of the dance beyond performance is dependent on documentation. Choosing a video format or storage media for documentation can sometimes seem like taking aim at a moving target in a shooting gallery. There seem to be so many choices, each offering different features and compression, but all carrying with them the questions of compatibility and longevity. There’s also the price to be considered. Comparisons typically come down to quality versus quantity, and affordability. Since no one can really predict what the future may hold as far as media storage and compatibility, the solution, at least for the meantime, seems to be finding a balance between current trends and long-term accessibility. Redundancy in multiple formats can’t hurt. One may also consider archiving the playback equipment along with tapes. Being informed about the shelf life of different formats is important, as well as budgeting for dubbing onto replacement media, or migrating to new formats, as needed. Consider the difference in archival format and an appropriate format for distribution. A collection of documented dance is practically worthless, unless attention has been given to contractual permission for access from the creator. One primary concern of choreographers is that video may be used to recreate their dances without permission. Because of this, some choreographers choose not to have their work documented. For those who do, it is important to detail, in writing, their desires and/or restrictions for the use of the documentation. Choreographers are often comforted knowing that they own the copyright to their work the moment it becomes fixed in a tangible medium of expression. Video can then become both the vehicle for ownership and the facilitator of infringement. Early in the process of planning a documentation project, one must address legal considerations, including contracts, waivers, and restrictions on viewing, dubbing, and access. A contract template, ideally approved by a legal consultant, may help facilitate this process. Formalizing in this manner is essential, even when working with friends and colleagues. Don’t be afraid to bring up the subject and discuss it. This can prevent tension and misunderstanding years after the act of documentation. Participant waivers are also essential to document permission for inclusion by all those appearing in the documentation product. By taking the business of dance seriously, one may help to develop an appreciation for choreography as a copyrightable art. Archives for dance documentation, like all archives, require a dedicated space, temperature and humidity control, and personnel to maintain the collection and help make it available to the public. 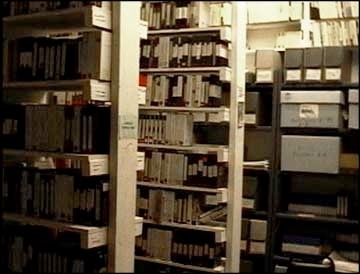 One issue related to a dance archive is one’s ability to efficiently locate materials. Another is ensuring that one-of-a-kind products are not lost in the case of fire or archival destruction. Tapes should be stored upright and kept in a cool, relatively dry environment. The recommended range for temperature is 60-73°F and a relative humidity of between 20-30%. Avoid temperature and humidity fluctuations; a range of no more than 7°F is advised. Recommendations vary from fluctuations of no more than 5% RH to fluctuations of no more that 20% RH. Off-site, or even underground storage of duplicate masters is recommended. Archival contents should be efficiently organized using metadata, and made available online. Once documentation videos have been generated, housed in an archive, and permission has been granted for viewing, then one must address the issue of access to the documentation product. Since these tapes are generally not mass-produced, and are sometimes considered rare collections, anyone interested in viewing is typically required to visit the archival location in person. Once on-site one encounters the need for compatible playback equipment, monitors, and headphones. Permission is not generally given for making a duplicate copy therefore, the viewer is dependent on memory or notes beyond the viewing experience. Care should be taken to duplicate a viewing/circulating copy of master tapes. First generation masters should never be used for viewing. From the original, a distribution or viewing master should be created in a format best suitable for universal viewing. DVD-video is currently a good solution for public access. Versions of restaged works or the documentation of visiting companies may be located in many university collections, when access to original cast/company is not possible. Also, checking with inter-library loan may result in the ability to view limited sources. Contribute to this list of issues and techniques/recommendations.